Has spontaneity hit you so hard that you're tucked in bed at 4am and that the next thing you know is that you are awake at 5am in a ride with your backpack going to a paradise? Well, this is what happened to us recently and I'd say it made us instant noob free divers. This 'spontaneity' took us to the underwater paradise of Binukbok in San Luis, Batangas. With no plans at all, we hit the road and crashed into Batangas' very own version of bikini bottom. This laid back place at the south looks plain and normal above sea level. We expected at least a stretch of sand at the shore. But then, there was nothing but rocks and diving platforms. Upon our arrival in Camp Raya Adventure Resort, we settled our stuff at a nipa hut, enjoyed our welcome drinks, wasted no time and got our diving gears. Beginners could go snorkeling just around the diving area because the water is shallow in that place. Life jackets and buoy are also available at a price. But if you want to go free diving, make sure you have a buddy and you at least know how to do it. Bladimir (Bladimir Dagat Remigio on Facebook) gave us free diving lessons. So there, after the orientation, we went into the waters not knowing what its bottom has to offer. We weren't ready to duck dive yet. lol. So we tried going deeper with the ropes at first. The sea got us like, "Wait for it". IT WAS SERIOUSLY AWESOME DOWN THERE! I was in awe and lost in the reverie the moment I laid my eyes with the goggles on underwater. 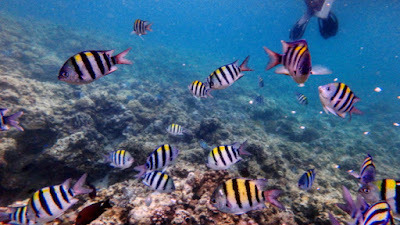 There were at least ten kinds of fish (I could name and recall some of them though like the angel fish, jack fish, parrot fish, sword fish lol) that I have seen hurling over someone who throws food at them. It was such a glorious scene for me. Few meters from it is was something like 10 feet or deeper. 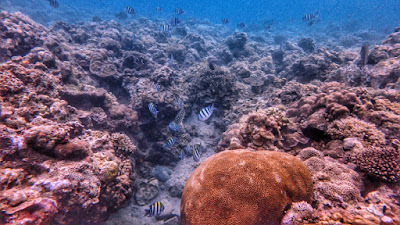 There were giant clams and other fishes swimming in synchronization. Also, it was said that it was a spot where the resident turtle stays. What's also not to miss in this place is the sunset. It is quite a perfect to relieve you from the tiresome floating and diving into the waters all day and it completes the laid back package of the place. >From Buendia, ride into a DLTB Co. Liner bus bound for Lemery. Alight at Xentro Mall Lemery (178php). >Ride a trycicle going to Lemery Public Market (10php/head). Tell the driver to drop you off Bagsakan Area. >Wait for Sir Manny or his staff to pick you up with his service boat and take you to Binukbok. >There are no convenient stores at the cove so it is advisable that you bring food enough for your stay. You can buy some at the Lemery Public Market. You can also use their cooking utensils but you gotta do it with the basic set up. If you weren't able to bring some, they can cook for you, too! Food is sumptuous, seriously! >As for the signal and Wi-Fi, HSPA+ is guaranteed, though. Electricity isn't much of a problem. >Further, make sure that you bring enough sun protection with you. The underwater scene is quite addicting that it would probably make you stay for hours in the waters. >If you're gonna do it DIY like what we did, make sure that you'll be in Batangas Grand Terminal or any other terminals before 10:00pm. Or else, you will be taking the ride home the next day at 4:00 or 5:00am. Hope this helps! Send me some love, though, if it did! Follow me on instagram and twitter and like my page on Facebook for more adventure and travel guides.